Our eSTORIS furniture eCommerce solution provides retailers with a website that is directly integrated to STORIS’ retail software. Whether you choose to sell online or begin by displaying product information that matches what’s in your showroom, a website broadens your brand’s presence across markets. True Unified Commerce: eSTORIS delivers the premiere furniture eCommerce software developed uniquely for a Unified Commerce strategy. eSTORIS is directly connected to STORIS’ in-store POS, mobile devices, and kiosks all provided by the industry’s trusted technology partner. This enables retailers to provide a consistent customer experience between the customer shopping online and visiting a store. 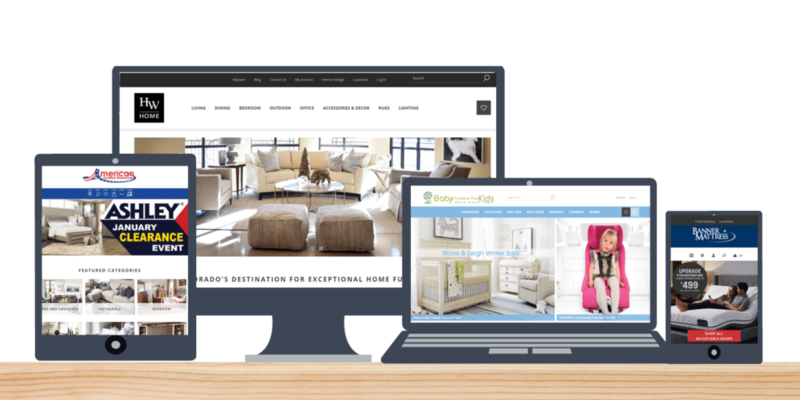 Sophisticated Web Design: eSTORIS allows retailers to design a furniture website that is sophisticated and functional. Retailers can choose from our mobile responsive design templates or work with design professionals on a custom website. UI/UX design services are also available to optimize the eCommerce experience for conversions. eSTORIS designs are optimized for use on both desktop and mobile devices in accordance with Google’s Mobile First Index. Advanced Inventory & Pricing Integration: Real-time integration with STORIS’ retail software enhances inventory management across channels, eliminating the tedious double entry. Advanced inventory integration for product families and kits is also available on the eSTORIS furniture store eCommerce platform. Customers can view real-time inventory quantities and accurate pricing with dynamic displays based on stock availability. The retailer also has options for how to automatically handle Out of Stock scenarios. Customer Tracking Features: eSTORIS allows you to create customer log-ins that match your website and your in-store systems through the customer email addresses. This allows retailers to retain integrated customer history throughout their STORIS database. Customers can create shopping carts across channels, easily check their order status, and manage their shopping history from the comfort of their homes. An SEO Optimized eCommerce Platform: eSTORIS is designed with Google Search Engine Optimization requirements in mind. Retailers stand to gain substantial benefits through working with our SEO professional on website rankings and conversions. Whether retailers are practicing local SEO or selling nationwide, SEO is imperative for success. eSTORIS has plugins to guide retailers in writing metadata and optimizing on-page SEO. Website Management & Professional Services: The team here at STORIS provides supportive services for eSTORIS, including functional and technical support. Your implementation project manager will provide a detailed project schedule and sitemap plan. Our team offers core training to help your web team become independent and efficient users of your website. eSTORIS’ built-in content management system (CMS) is user-friendly and makes it easy for retailers to control the day to day management and build out fresh content. Professional SEO and design services are also available to help our retailers get the most out of their websites. Hosting: STORIS provides scalable website hosting with top-tier security and related system services exclusively for our eSTORIS Clients. eSTORIS hosting enables retailers to focus on the day to day management of their website and puts the technical requirements in our hands. We guarantee network uptime and premium quality bandwidth. Our team also provides comprehensive performance monitoring including server health maintenance and tracking. Multi and single tenancy available. Website Analytics: eSTORIS is integrated into STORIS’ Business Intelligence Suite, allowing retailers to report on real-time website performance that is also directly integrated with Google Analytics data. 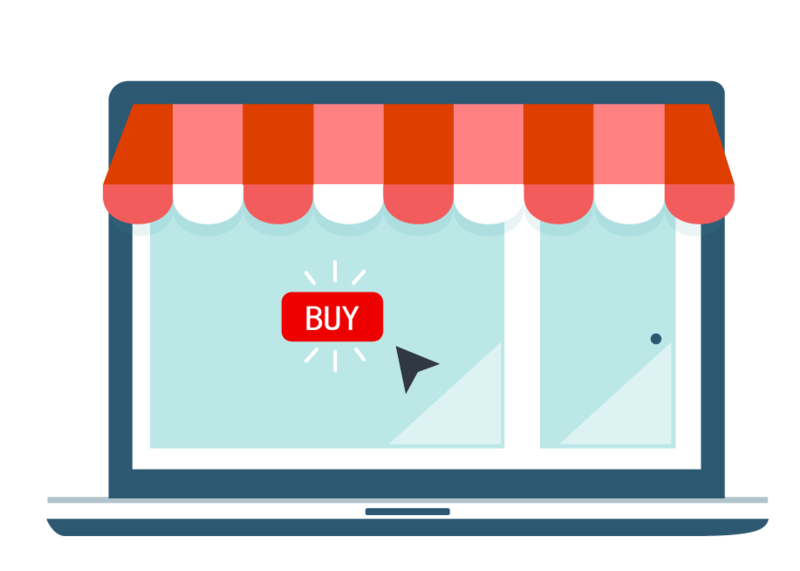 Having a dynamic eCommerce website enables retailers to actively participate in their customers’ shopping journeys, which typically begins with online research. eSTORIS’ website technology will help drive traffic to your brick & mortar stores and maximize revenue potential. The ability to integrate in real time between your STORIS database and eSTORIS website improves the customer’s experience when shopping your brand. Whether you are operating an established eCommerce site or need help creating your first furniture website, the STORIS eCommerce team is here to help! Fill out the form to discover why eSTORIS is the leading furniture retail eCommerce provider today.